According to Revolutionary lore, Nancy Hart famously outwitted a group of Tories who had invaded her home. She served them liquor, and once they were drunk, filched their weapons, which she used to shoot two of the men and hold the rest captive until help arrived. Nancy Morgan was born in the Yadkin River Valley of North Carolina in 1753. She grew up to be a very tall, muscular woman with red hair, blue eyes and a smallpox-scarred face. Nancy was feisty and had a quick temper. Local Cherokees referred to her as war woman. She was illiterate but ran her household well and was knowledgeable about frontier survival. She was a skilled herbalist and an excellent shot. Nancy Morgan married Benjamin Hart, and moved with her husband to northern Georgia. She was a domineering wife. 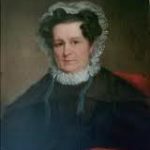 Many remembered that she, rather than her husband, ran the Hart household, which eventually included six sons and two daughters. Nancy Morgan Hart was a heroine whose exploits against Loyalists in the Georgia backcountry are the stuff of legend. Because stories about her are mostly unsupported by documentation, it is impossible to entirely distinguish fact from folklore. During the Revolutionary War, Patriots were referred to as Whigs; American colonists who remained loyal to Great Britain were called Loyalists, also Tories. 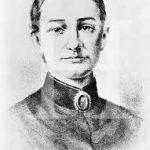 During most of the war years, Hart was alone on the frontier with her children, while her husband served as a lieutenant in the Georgia militia under Elijah Clarke, who led frontier guerrillas and inflicted a heavy toll on the British and Loyalists. Nancy managed to sneak away periodically to work as a spy. She would dress as a man and enter Tory camps and British garrisons pretending to be feeble-minded in order to gain information, which she subsequently passed along to the Patriots. Nancy was determined to rid the area of Tories, who made frequent stops at the Hart cabin, keeping a close eye on the patriotic woman. In one incident her daughter noticed a Tory spying on the family through a hole in the wall. Nancy was making soap at the time and threw a ladle full of boiling soap through the crack, scalding the man. She then hog-tied him and turned him over to the Patriots. 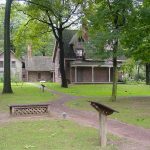 Nancy Hart’s most famous patriotic act involved six British soldiers, who came by her log cabin looking for a Whig they were pursuing. They killed the last turkey in her yard and demanded she cook it for them, which she agreed to do. As the soldiers entered the cabin, they placed their guns by the door and sat down at her table to eat. She also generously shared her corn liquor, ensuring that the soldiers were well intoxicated. While the turkey was cooking, Nancy sent her daughter to fetch some water from the spring and secretly instructed her to blow a conch shell there to warn her husband and the neighbors. While the soldiers were preoccupied with their dinner and drink, Nancy began to sneak their guns through a hole in the wall of her cabin, but was caught in the act. She quickly drew the gun on the soldiers and threatened to shoot the one who moved first. 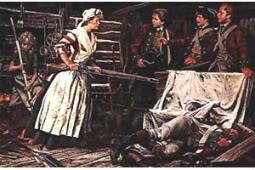 She kept her word and after one of the soldiers made an advance on her, she shot and killed him. The remaining men rushed at her, and she shot and wounded another. When her husband arrived, Hart still held the British soldiers at gunpoint. Her husband suggested they shoot them, but Nancy thought that was to good for them; instead her husband and a few neighbors hung the soldiers from a nearby tree. There exist various versions of this story, all of which agree in general, but provide different details. In 1912 workmen grading a railroad near the site of the old Hart cabin unearthed a neat row of six skeletons that lay under nearly three feet of earth and were estimated to have been buried for at least a century. This discovery seemed to validate the most oft-told story of the Nancy Hart legend. Nancy was well connected through family ties to many prominent figures in early American history. 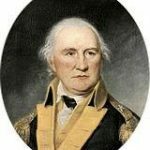 She was a cousin to Revolutionary War General Daniel Morgan, who commanded victorious American forces at the Battle of Cowpens in South Carolina on January 17, 1781. The Harts continued to live in the Broad River settlement for several years after the Revolution. In 1790 the area was cut from Wilkes County and incorporated into a new county, called Elbert. By then Nancy Hart had found religion through a new Methodist society that had formed in her neighborhood. During the late 1790s, the Harts moved to Brunswick, Georgia. Benjamin Hart died shortly thereafter. Nancy Hart then moved back to the Broad River settlement, only to find that a flood had washed away the cabin. Eventually she settled with her son, John, along the Oconee River in Clarke County near Athens. Around 1803 John Hart moved his mother and family to Henderson, Kentucky, to live near relatives. Nancy spent the remaining years of her life there. Nancy Morgan Hart died in 1830 and was buried in the Hart family cemetery outside of Henderson, Kentucky. In the 1930s, on the site of Hart’s frontier cabin along River Road in Elbert County, Georgia, the Daughters of the American Revolution erected a replica log cabin using stones from the chimney of the original cabin, which had stood on the crest of a large hill overlooking Wahatche Creek. Georgians have memorialized Nancy Hart in a number of ways. Hart County, Elbert County’s neighbor to the north, was named for her, as was its county seat, Hartwell. During the Civil War, a group of women in LaGrange, Georgia, founded a militia company named the Nancy Harts to defend the town from the Union army. In 1997 Hart was inducted into Georgia Women of Achievement, a statewide organization dedicated to publicizing, researching, and providing educational materials about the accomplishments of outstanding women in Georgia history. I think she was born around 1735, not 1753.